Please visit our Transportation Page to view a video explanation of the parking meters at our Downtown pickup location. Members get special discounts, travel deals and more! "You have a face for radio!" It’s a common joke around the Sports Leisure Vacations office. Truth is, Mark, Clayton and other staff members can be heard (but not seen) weekly on KFBK. All we ask is for 60 minutes of your time. In exchange Mark and co-host Tom Romano will give you a fast-paced, information-filled hour designed with only one goal in mind: To make you a smarter traveler. The Travel Guys Radio Show is presented live every Sunday afternoon from 3 to 4 p.m. at 530 AM or 93.1 FM. You can also listen at www.kfbk.com or on the iHeartRadio app. 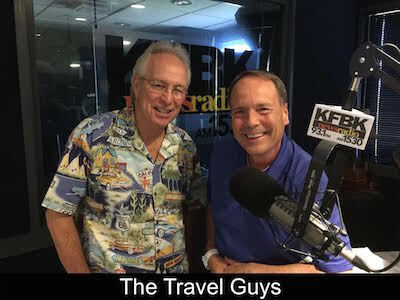 Visit www.travelguysradio.com for the list of topics to be covered in the next program, special guests, weblinks to related sites and even podcasts of past shows. Through the Contact link, you can pose your travel questions to our panel of experts. Yours might even be answered on the air! New to Sports Leisure Vacations? Learn more about what it's like to travel with us for the first time! We've been told the Sports Leisure community is more like a family than anything else, and that's something we're proud of. Unique destinations, great food, interesting people and top-tier service are what we're all about! Our staff of 17 brings an amazing 424 years of travel industry experience to the table, 215 of those years with Sports Leisure Vacations.